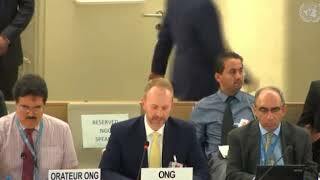 there have been no genuine discussions of Iraq in this Human Rights Council. Iraq is now host to massive, grave and systematic human rights violations so numerous and varied that they cover the full mandate of this Council. From violations of civil and political rights, for example, the killing of protesters and control of the press, to economic, social and cultural rights, such as lack of clean water, sanitation, adequate food, education, health care and medicine – the list is unfortunately long indeed. In particular, we want to stress the abhorrent situation of detention and prisons in Iraq. Yearly, governmental forces and militias in Iraq arbitrarily arrest and detain innocent civilians, and torture and kill many of those in detention and prison. Right now, hundreds of thousands are arbitrarily detained or imprisoned across the country. As a result, the prisons are severely overcrowded. The most urgent situation is the Al Hout prison in Al Nasirya. This prison hosts a number of former high-ranking government officials, many of whom are now advancing in age. They are regularly subjected to such ill treatment that several have died in custody. They are denied visits from family members and the ability to receive needed medicines. Due to the dire nature of the situation in Iraq, we strongly urge this Council to take quick action. We realize that politics may be a strong deterrent to action by the Council, but it is incumbent upon the international community to address a situation that was initially created by foreign intervention.